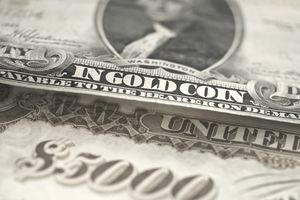 Gold has been used as the currency of choice throughout history. The earliest known use was in 643 B.C. in Lydia. Lydia is present-day Turkey. Gold was part of a naturally occurring compound known as electrum, which the Lydians used to make coins. By 560 B.C., the Lydians had figured out how to separate the gold from the silver, and so created the first truly gold coin. The first king to use gold for coins was named Croesus. His name lives on in the phrase "rich as Croesus." In those days, the value of the coin was based solely on the value of the metal within. The country with the most gold had the most wealth. So, Spain, Portugal, and England sent Columbus and other explorers to the New World. They needed more gold so they could be wealthier than each other. When gold was found at Sutter's Ranch in 1848, it inspired the Gold Rush to California. That helped unify western America. In 1861, Treasury Secretary Salmon Chase printed the first U.S. paper currency. The Gold Standard Act established gold as the only metal for redeeming paper currency. It set the value of gold at $20.67 an ounce​. By the mid-1800s, most countries wanted to standardize transactions in the booming world trade market. They adopted the gold standard. It guaranteed that the government would redeem any amount of paper money for its value in gold. That meant transactions no longer had to be done with heavy gold bullion or coins. It also increased the trust needed for successful global trade. Paper currency now had guaranteed value tied to something real. Unfortunately, gold prices and currency values dropped every time miners found large new gold deposits. Once the Great Depression hit with full force, countries once again had to abandon the gold standard. When the stock market crashed in 1929, investors began trading in currencies and commodities. As the price of gold rose, people exchanged their dollars for gold. It worsened when banks began failing. People began hoarding gold because they didn't trust any financial institution. On April 5, FDR ordered Americans to turn in their gold in exchange for dollars. He did this to prohibit hoarding of gold and the redemption of gold by other countries. This created the gold reserves at Fort Knox. The United States soon held the world's largest supply of gold. On January 30, 1934, the Gold Reserve Act prohibited private ownership of gold except under license. It allowed the government to pay its debts in dollars, not gold. It authorized FDR to devalue the gold dollar by 40 percent. He did this by increasing the price of gold, which had been $20.67 per ounce for 100 years, to $35 per ounce. The government's gold reserves increased in value from $4.033 billion to $7.348 billion. This effectively devalued the dollar by 60 percent. The Depression ended in 1939. That allowed countries to go back on a modified gold standard. The 1944 Bretton Woods Agreement set the exchange value for all currencies in terms of gold. It obligated member countries to convert foreign official holdings of their currencies into gold at these par values. Gold was set at $35 per ounce. Track the price of gold from 30 B.C. to the present through the gold price history. The United States held most of the world's gold. As a result, most countries simply pegged the value of their currency to the dollar instead of to gold. Central banks maintained fixed exchange rates between their currencies and the dollar. They did this by buying their own country's currency in foreign exchange markets if their currency became too low relative to the dollar. If it became too high, they'd print more of their currency and sell it. It became more convenient for countries to trade when they peg to the dollar. As a result, most countries no longer needed to exchange their currency for gold. The dollar had replaced it. As a result, the value of the dollar increased even though its worth in gold remained the same. This made the U.S. dollar the de facto world currency. In 1960, the United States held $19.4 billion in gold reserves, including $1.6 billion in the International Monetary Fund. That was enough to cover the $18.7 billion in foreign dollars outstanding. But as the U.S. economy prospered, Americans bought more imported goods, paying in dollars. This large balance of payments deficit worried foreign governments that the United States would no longer back up the dollar in gold. Also, the Soviet Union had become a large oil producer. It was accumulating U.S. dollars in its foreign reserves since oil is priced in dollars. It was afraid that the United States would seize its bank accounts as a tactic in the Cold War. So, the Soviet Union deposited its dollar reserves in European banks. These became known as eurodollars. By 1970, the United States only held $14.5 billion in gold against foreign dollar holdings of $45.7 billion. At the same time, President Nixon's economic policies had created stagflation. This double-digit inflation reduced the eurodollar's value. More and more banks started redeeming their holdings for gold. The United States could no longer meet this growing obligation. The gold standard ended on August 15, 1971. That's when Nixon changed the dollar/gold relationship to $38 per ounce. He no longer allowed the Fed to redeem dollars with gold. That made the gold standard meaningless. The U.S. government repriced gold to $42 per ounce in 1973 and then decoupled the value of the dollar from gold altogether in 1976. The price of gold quickly shot up to $120 per ounce in the free market. Once the gold standard was dropped, countries began printing more of their own currency. Inflation resulted. But for the most part, abandoning the gold standard created more economic growth. Gold, though, has never lost its appeal as an asset of real value. Whenever a recession or inflation looms, investors return to gold as a safe haven. It reached its record high of $1,895 an ounce on September 5, 2011.